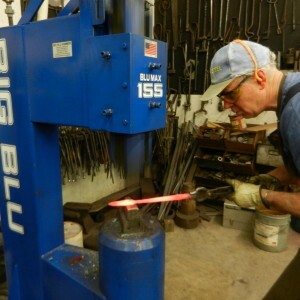 Once David had researched the market and we’d decided to buy a Big Blu power hammer, we flew to Asheville, North Carolina to visit the factory. The idea was to decide which model suited our needs, and take some training so that we would become more familiar and confident with a different way of working. It all turned out splendidly. Josh from Big Blu met us at the airport and drove us to Dean Curfman’s home in Morganton, an hour away. 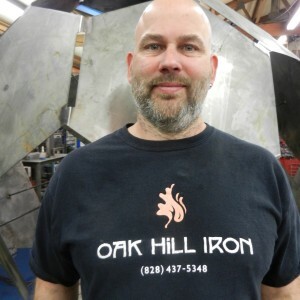 Dean is the owner of Oak Hill Iron, home of the Big Blu. He and his wife Lynn invited us to stay with them and treated us as honoured guests. We were touched by their generous Southern hospitality. Their beautiful 138 year old house is on the 25 acre site of Big Blu. 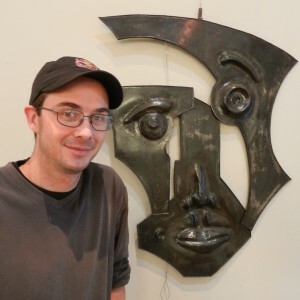 Set in woodland at the base of the Blue Ridge Mountains, the modern factory, gallery and showroom is the workplace for a dedicated, efficient team of workers. Everyone knows their job and does it well. I was impressed by their knowledge and commitment to making this fifth generation air hammer to be the best quality possible. 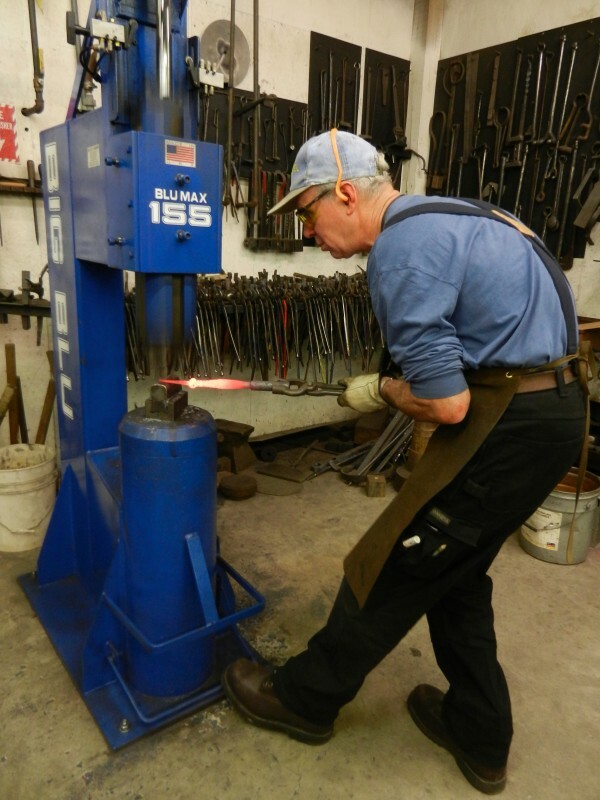 We chose the largest model, Big Blu 155, because it has the greatest height between the dies, enabling us to use existing spring tools made for our old Blacker. Andy Chapman demonstrated so many new techniques in the time available and patiently trained both of us for two days of intensive hands on instruction. 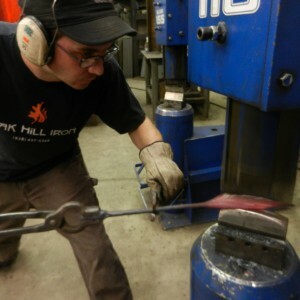 He showed us how to change the speed to a single blow, so that my maker’s mark punch will work. We bought a set of 12 dies and learned how to use them. 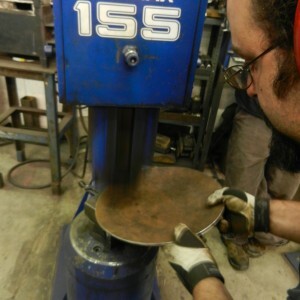 My favourite is the bowl dies and Andy Phillips showed us how to make a 12″ bowl on the power hammer. A new Ingersoll Rand 10 hp compressor and set of 12 instructional DVDs completed our package. We saw our very own serial #1388 machine, freshly painted in distinctive vibrant cerulean blue by Dave. 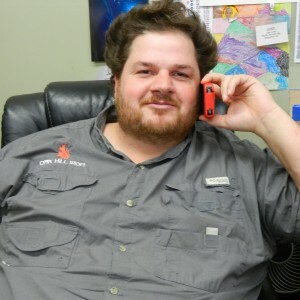 David added a fullering tool set and two sets of S7 5/8″ punches and drifts to our order and Josh kindly gave us a gift of heat resistant gloves and three new hand hammers. 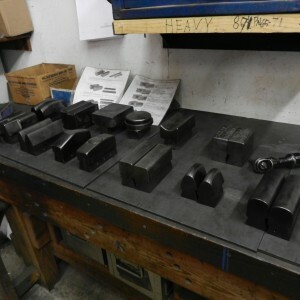 All the samples we made will be packed by Neil and shipped to us with the power hammer. We’ve arranged the shipping ourselves, but could have chosen to go through the Canadian dealer in Ontario. All we have to do now is find a new home for our retired Blacker B mechanical power hammer, and prepare to welcome One Five Five to Fernie Forge. It was a fabulous experience. The service Big Blu offers is outstanding. 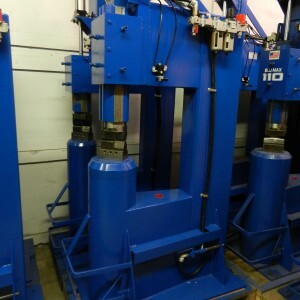 We thoroughly recommend this air hammer and look forward to using it for the rest of our working lives. Many thanks to Lynn for her delicious home cooked meals and gracious hospitality, Dean and team for developing and continuing the business of building power hammers since 1998, and Dean’s Mom, who we didn’t meet but made us cookies for the journey home. If the thoughtful care and attention to detail shown to us extends to our new power hammer, and I’m sure it does, we will continue to be delighted with our investment. Big Blu is an exemplary company and we’re very pleased to become part of their extensive worldwide family.